More countries are restricting imports of foreign plastic waste, as new data shows a dramatic rise in exports of UK waste to a raft of countries following China’s decision to ban “foreign trash” in January. An Unearthed analysis of official customs data reveals that UK plastic waste exports to countries as diverse as Malaysia, Thailand, Vietnam and Poland shot up in the first three months of 2018, after which all countries introduced restrictions on imports. Environment Secretary Michael Gove said in December that Britain had to “stop offshoring our dirt” and deal with its plastic waste at home. But he also said that in the short term, the country would continue sending its rubbish abroad. Labour MP and member of the Environmental Audit Committee, Kerry McCarthy, told Unearthed that the government had failed to “come to its senses” since the China ban. She said: “I thought the China ban would bring the government to its senses in demonstrating we could no long rely on exporting our plastic waste. But instead the minister… challenged the view of this as a crisis, and left it to the market to find alternative export markets. Six months after the China ban came into effect, countries across the globe are feeling the impact. In Poland, a series of highly polluting fires at waste dumps across the country forced the government to introduce new rules that will make it harder to import waste into the country. Announcing the restrictions, Interior minister Joachim Brudzinski blamed the China ban for causing an “increase in illegal imports to Poland of materials that should not be in our country”. In the first four months of 2018, the UK exported 31% more waste to the country, a rise of almost 3,000 tonnes to 11,899 tonnes, compared to the same period last year, our analysis shows. Vietnam has also moved to make restrictions, announcing a temporary ban on plastic and paper waste imports from the middle of this month until October. Two of the country’s biggest ports – Tan Cang-Cai Mep International and Tan Cang-Cat Lai – have reportedly become overwhelmed with plastic and paper scrap since the China ban came into force in January. Tan Cang-Cat Lai port is currently dealing with a backlog of 1,132 shipping containers due to plastic scrap imports, according to a letter sent by officials at Tan Cang-Cai Mep to shipping companies and to the US Institute of Scrap Recycling Industries. UK plastic waste exports to Vietnam increased by 51% in January to April 2018 – from 9,680 to 14,570 tonnes. Other countries have also introduced temporary restrictions since January. Citing “the escalating number of idle containers of recycled plastics” in Malaysia and Thailand, the shipping line APL wrote to its customers on April 19 to announce a “temporary ban of plastic scrap shipments” from the US and Canada to both countries. UK exports to Malaysia rose sharply in the first four months of 2018, compared to the same period last year, from 15,612 tonnes to 51,549 tonnes. Meanwhile, exports to Thailand increased dramatically, from just 123 tonnes in January to April 2017 to 6, 810 tonnes this year. If more countries introduce restrictions, figures in the waste sector said that this could add to the crisis facing the UK recycling sector and put more pressure on local authorities. Head of the Recycling Association, Simon Ellin, said his organisation had seen the restrictions from other countries coming after the China ban and warned that the UK recycling sector would continue “lurching from crisis to crisis” until it invested in processing capacity. With exporting to China no longer an option there has been a modest reduction in waste being sent overseas. Our analysis shows that the UK exported 33,453 fewer tonnes of plastic waste in the first four months of 2018 compared to the same period last year, a drop of 17%. According to Ellin, some recyclers are carrying more low grade material than they would normally as the industry waits for prices to recover. At the same time, low grade plastic waste – agricultural and industrial film and some varieties of pots, tubs and trays, for example – “currently either doesn’t have a market or is now uneconomic to recycle”. Adam Read, external affairs director at waste firm Suez told Unearthed: “There is always a risk that other countries start to get flooded and close their doors. That’s an inevitability of moving millions of tonnes out of China and dumping it on the global market. Before China decided to shut its doors to foreign plastic waste at the start of this year, the UK sent a huge amount of scrap to the country. Unearthed reported late last year that nearly two-thirds of the UK’s total waste plastic exports went to China and Hong Kong from January 2012 to September 2017. Overall, British companies sent just under 88,000 tonnes of waste to China in the first four months of 2017. 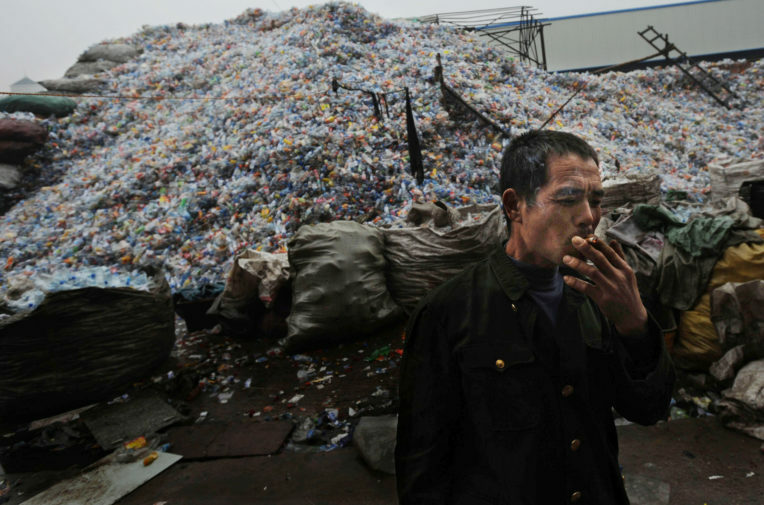 But that figure has dropped to less than 2,500 tonnes this year, with China now only accepting high-quality plastic scrap. Today British companies have sought out other countries. As well as Poland, Vietnam, Thailand and Malaysia: exports to Turkey also rose, up 166% from 10,598 tonnes to 28,219 tonnes. Exports to Taiwan increased by more than 1,200%. Other countries experiencing significant increases include Pakistan (+78%), India (+37%) and Indonesia (+19%). The UK is not alone in the crisis. New Zealand is reporting similar trends, while the China ban has reportedly put a major strain on US recyclers. One major waste company in the US warned that “material being collected on the street doesn’t have a place to go”. According to a comprehensive rundown of the impact of the ban in the US on the site Waste Dive, in Florida there are reports of material being sent to landfill. In Boise, Idaho, the city is facing a $100,000 per month bill to recycle an estimated 640 tonnes of mixed paper due to rising processing costs. Meanwhile, Hawaii recyclers are scrambling to find alternative markets to ship plastic waste. The amount of plastic in our oceans has been called a "planetary crisis" by the UN. Unearthed is covering the plastics crisis and investigating the companies driving it. But we need your help. By donating to Greenpeace, you’re supporting the kind of journalism we need more of at the time we need it most.